This recipe is adapted from Vitamix Creations Recipes. 1 - can garbanzo or chickpeas, drained --reserve liquid in a small bowl or cup. *toast sesame seeds in a nonstick pan until golden. You do not have to toast them, but it gives the hummus a deeper flavor. Place all ingredients into the Vitamix Blender; Secure lid. Select Variable 1. Turn machine on and slowly increase speed to 10, then to high. Blend on high, using the damper to push ingredients into the blades. If making this in a food processor. Buy Tahini at your grocery store. It is in the whole foods/organic section near the peanut butter. Tahini is pureed sesame seeds. A standard blender or food processor will not puree the seeds the same as the Vitamix. This should work in a blendtec or a ninja food processor. For even deeper flavor, try a roasted garlic clove. 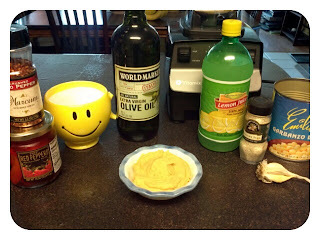 For a fancier hummus -- Top hummus with a little drizzle of olive oil, a dollop of chili paste, and some refrigerated garlic. Makes a great dish to bring to a BBQ, pot luck, or party. Pair with pita chips, pretzel chips, carrots, celery, bell pepper, tiny tomatoes, or snap peas.